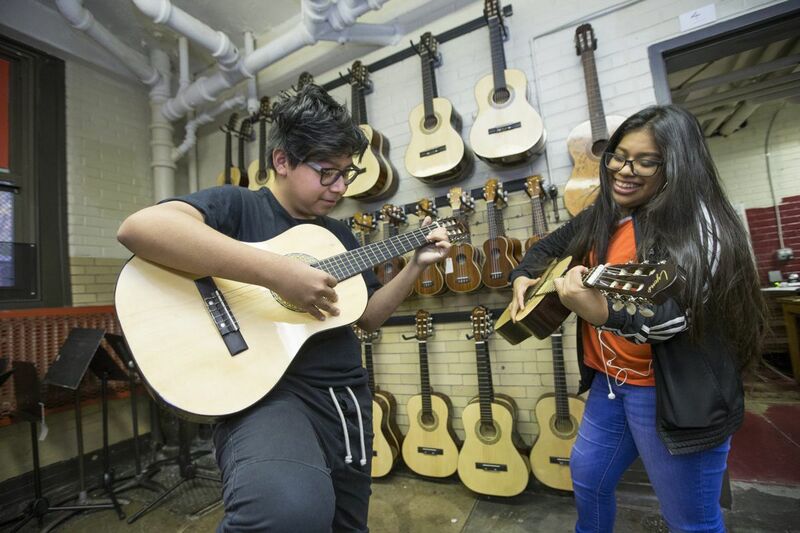 Former Home members Brandon Emigdio, left, and Maria Moreno play around on guitars before the screening of a documentary about their elementary school’s rock band. The light switch clicked off, and their lives projected onto the big screen — tension and triumph, drama and ambition — and rock music underlying and imbuing everything. For more than a year, local filmmaker Ben Kalina documented the story of Home, the remarkable rock band made up of kids from the school a few blocks from his house: Andrew Jackson, a public K-8 in South Philadelphia. Last week, he screened the film for current and former members of the band. On Sunday, Home: A Rockumentary made its debut on WHYY, with more airings planned. It's the story of teacher Chrisostomos Argerakis, who built a music program from nothing and started a rock band that ended up earning ovations at the Trocadero and playing to 10,000 people in venues all over the region, all while he donated his time to lead the band and went years without a raise. It's the story of a group of Philadelphia kids — with all the challenges and promise that entails — for whom Home is everything. It's fitting that the idea for his project began with the sounds of rock songs drifting out of a basement classroom at Jackson, located at 12th and Federal. Kalina lives a few blocks away from the campus, and always wondered about the music he heard when he walked by the school, even hours after classes let out. He met Argerakis through a friend and began to think Home's story would make a compelling documentary. The narrative elements were there: Argerakis, in the 2015-16 school year the film encapsulates, wasn't sure how much longer he could keep up the pace of running Home for free and working side jobs to supplement his income amid a pay freeze that wasn't lifted until this year. Kaplan, who retired as Jackson's principal in June, did the best she could, yet struggled daily to make ends meet at her school, made up mostly of students living below the poverty line. "It's a bite-sized way to talk about the magic of public education and what makes it so frustrating," said Kalina. Kalina found himself astonished by Argerakis' devotion to teaching and to the band — and by the kids' talent and work ethic. Band member Maria Moreno missed only three practices and gigs out of 400 in the years she played guitar in Home. She started when she was so young that she could barely wrap her arms around the instrument. "You'll never know if you're a bass player unless you pick up a bass," said Argerakis. "They found what they want to do, what they should be doing." Music teacher Chris Argerakis, left, is hugged by former Home band member Skye Rosario following the screening. Argerakis started his teaching career at Jackson in 2008 at a school that had nothing but an out-of-tune piano and a few broken bells. He raised funds for instruments — recorders, at first, and then guitars. He taught kids to play "Ode to Joy" and "Greensleeves" in a before-school program, but they begged him to play songs they could sing along to. He carted in his own equipment, and the band took off. They named it Home after the Edward Sharpe and the Magnetic Zeroes song, and for what it came to mean to students. Home evolved into a popular after-school activity that plays for mayors, jams with stars, rocks out at big venues, sells its own merchandise, and even has its own farm team, a junior band of younger students. Even now, it operates on a budget of zero, existing because of donated instruments and Argerakis' donated time. On Thursday night, Kalina's film played in Argerakis' classroom with the members of the 2015-16 band in attendance, as well as supporters of the band — current principal Kelly Espinosa, parents, the neighbor who lugs the band's gear to gigs for free. Julia Yedra, now 15 and a sophomore at Central High School, was glad she chose to sit in the back row. She didn't want people to notice she was crying. "I miss it," said Yedra, who plays bass. "It meant so much to me, and the movie just captured our experience."